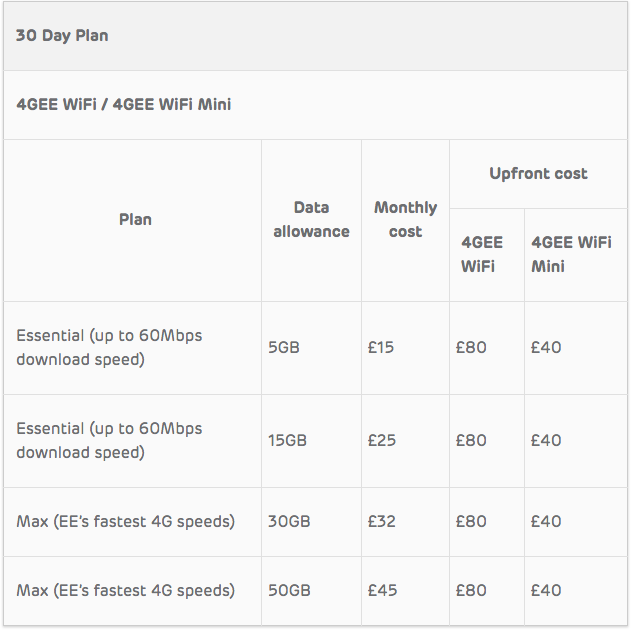 EE today revealed new mobile broadband plans offering customers great value as well as new 4GEE WiFi and 4GEE WiFi Mini devices designed to give customers superfast 4G speeds in more places than any other operator and improved performance for those who need the best connectivity on the go. Smaller and lighter than previous versions, the new 4GEE WiFi and 4GEE WiFi Mini are more portable than ever and are perfect for keeping all your devices connected when out and about. The new, CAT 12 enabled 4GEE WiFi (capable of supporting theoretical download speeds of up to 600Mbps) provides access to EE’s superfast 4G+ speeds while providing a high capacity connection to 20 devices simultaneously. The device comes with a powerful 4,300 mAh battery bank offering up to 15 hours of use. It also supports USB Type C charge, so users can charge both their handsets and tablets faster than before. The 4GEE WiFi supports WiFi 802.11a/b/g/n/ac. Meanwhile the smaller new Cat 7 enabled 4GEE WiFi Mini (capable of supporting theoretical download speeds of up to 300Mbps) also connects up to 20 devices and is perfect for those who want practical connectivity in their pocket at all times. The device supports WiFi 802.11a/b/g/n/ac and weighs in at just 85g, with a 2,150 mAh battery offering up to 8 hours use. For more information on EE’s new 4GEE WiFi devices, please visit www.ee.co.uk/4geewifi and www.ee.co.uk/4geewifiminiEE is also offering the 4GEE WiFi with 2GB data on pay as you go for £89.99 and the WiFi Mini with 2GB data for £59.99.